Serious birth injuries occur in about 60,000 of the 4 million live births in the U.S. each year. Rates for medical malpractice lawsuits are particularly high in the State of Louisiana, with 3.4 claims for every 1,000 people – the third-highest in the U.S. next to Oklahoma and Vermont. It’s especially tragic when medical malpractice affects the youngest Louisiana residents, causing severe and lasting harm. A complicated delivery costs parents more than double a straightforward birth, and often results in additional medical expenses for years to come. The heaviest toll of all is the emotional distress, pain, and heartache arising from watching a baby suffer through injury and disability – especially considering that one-third of all birth injuries are caused by medical errors or negligence. Hospitals owe a certain standard of care to their patients, which can be corroborated by other medical professionals in the field. If you suspect you or your baby were not treated right, you can have a birth injury lawyer look into the matter to determine whether your child’s injuries were due to ineptitude or some type of mistake. 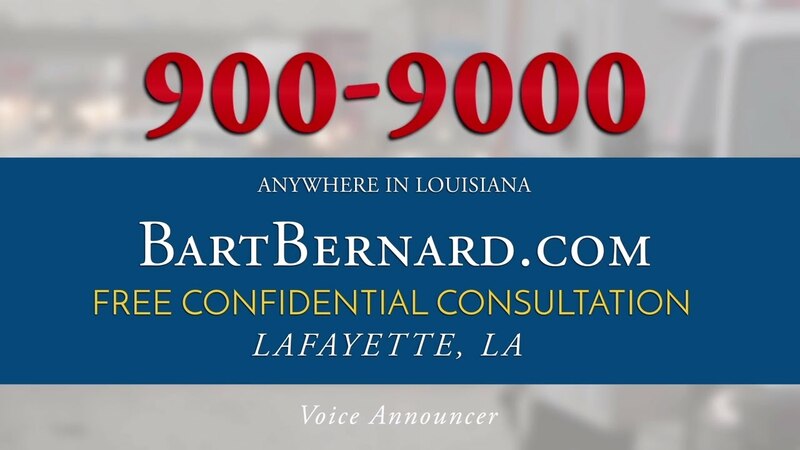 Lafayette and Baton Rouge Attorney Bart Bernard is available to discuss your concerns and help clear up the confusion over what happened. Should you file a birth injury lawsuit? Hospitals that implemented the program saw a 25% decrease in asphyxia and oxygen deprivation and a 22% drop in birth trauma. The hospitals worked to create better medical teams with clearly defined roles to avoid confusion. They worked to eliminate lapses in care that occurred at shift change time. They participated in regular drills using models to see how their teams functioned in the event of a serious complication. Not every hospital has adopted these recommendations, but having to defend against a birth injury lawsuit will have medical administrators taking a closer look at their process and ways to improve it. After all, successful birth injury claims often result in hundreds of thousands, if not millions of dollars, in compensation paid to plaintiffs. If you’re unsure about what happened, get peace of mind. It costs you nothing to have a lawyer take a closer look to see whether you have a substantial case for medical malpractice or negligence. What type of incidents does a birth injury law firm look into? The statute of limitations is defined as the time period in which you can legally file a lawsuit. This law is designed to limit frivolous claims and protect citizens from having to defend themselves in court for something that happened so long ago they have no record or recollection of said incident. Failure to file within the allotted timeframe results in dismissal and disqualifies a plaintiff from any potential compensation. The statute of limitations for birth injuries in Louisiana is one year from the time of injury. If the injury is discovered after a year, the plaintiff has no more than three years from the time of discovery to file a personal injury lawsuit. If the baby has died as a result of injuries sustained at birth, the wrongful death claim must be submitted within a year from the date of death. The challenge with birth injuries is that the “damage” done is not always visible immediately. Sometimes the nature of the injury or disability only manifests once the child is old enough to miss certain developmental milestones and learning deficits. The “Discovery Rule” often applies to birth injury cases, where the clock doesn’t start ticking until the time the injury was discovered. This can be several years after the birth of the child. Keep in mind, it is always best to start the claim as soon as possible by contacting a lawyer. The quicker you act, the more evidence your legal team will have access to. Birth injury attorneys make sure all paperwork is filed within state deadlines, so you don’t have to worry. The majority of successful birth injury lawsuits result in settlement, rather than go all the way to court. These settlements include payment for immediate medical expenses, lost time off work, specialized equipment, and emotional pain and suffering. Louisiana places a damage cap of $500,000 on medical malpractice claims, meaning that this is the maximum amount you may recover for a birth injury lawsuit. In Louisiana, any amount over $100,000 is paid out by the state Patient’s Compensation Fund, an insurance-type fund that automatically covers all state health care providers that meet eligibility requirements. The constitutionality of the Louisiana medical malpractice cap has been upheld by the courts as recently as 2012. There is one exception to the rule, however: additional amounts can be added to a settlement or recovery if the child has ongoing medical expenses or lifelong disability. Costs associated with special education, specialized equipment, in-home care, physical therapy, and other long-term rehabilitation needs may be eligible for additional payments beyond the cap. It takes the work of a skilled birth injury lawyer to negotiate on your behalf and fight for your legal rights. Live in Louisiana? Birth injury lawyer Bart Bernard is here for you! Birth injury attorney Bart Bernard is a native of Lafayette, Louisiana who lends a compassionate ear to grieving families. Since he opened his first Louisiana law firm in 1997, his concern for the wellbeing of others and strong negotiating experience has pushed him to aggressively pursue justice and secured multi-million-dollar awards for his clients. He has an extensive network of respected medical professionals who can testify on your behalf in birth injury cases. His knowledge of patient rights, hospital standards of care, and personal injury law is unsurpassed. Bart Bernard is at your service for a free, no-obligation case review. He works on a contingency basis only, meaning that no legal fees are due unless you are paid a settlement or jury award.